Have you been looking into alternative healthcare options to help you to save? If so, then you will enjoy this review. 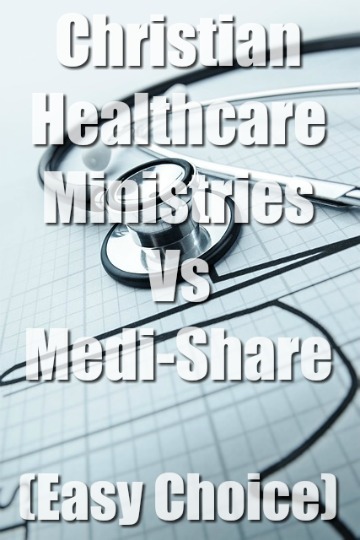 Today, we will be comparing Christian Healthcare Ministries Vs Medi-Share. In this article, we will take a look at the price, sharing limit, the numbers of providers that each sharing company has to offer, and more. CHM was founded in 1981. Their members have shared well over $2 billion in medical bills. Medi-Share started in 1993 and has over 300,000 members. How do health sharing ministries work? Sharing ministries are not insurance companies. They are not tax deductible. However, they are similar to health insurance companies because they give you healthcare at an affordable cost. With a sharing ministry you will be able to share someone else’s medical bills while someone shares your medical bills. With Medi-Share you are able to do more than share. You will be able to pray for and encourage other members who you have supported and who supported you. Medi-Share allows you to build relationships. If you feel led you will be able to disclose information and connect with others, which is one of the great benefits of Medi-Share. Get a Medi-Share quote today. The Medi-Share program might be the most affordable sharing ministry out there. Medi-Share allows you to save more than CHM. Some members are able to get rates for as low as $30 a month. Most Medi-Share members report healthcare savings of over $300 a month. Your monthly rates can be anywhere from $30 to $900 a month, depending on a number of factors such as the size of your household, age, and AHP. Your Annual Household Portion is similar to a deductible. This is the amount that have to pay before your bill is eligible for sharing. Your AHP is only going to be for more serious doctor visits. There are several Annual Household Portions for you to choose from ranging from $500 to $10,000. The higher your Annual household portion the more you will be able to save. Get a quote today see how much you will pay with Medi-Share. Christian Healthcare Ministries has 3 healthcare plans that you are able to choose from. CHM offers the Bronze plan, Silver plan, and a Gold plan for their members. These plans range from $90-$450/mo. CHM differs from Medi-Share and other sharing ministries. Unlike other health share programs, CHM works differently. With CHM you do not have negotiators backing you up. CHM does not negotiate medical bills, which leaves it up to the member to negotiate the cost. This can be a hasslesome process for some CHM members. If negotiating the cost and trying to get discounts is not your strong suit, then you can end up paying more than you have to. All of their plans have a personal responsibility, which is similar to a deductible. This is the amount that you must pay before your medical bills can be shared. The Bronze program has a personal responsibility cost of $5000 per incident. The Silver program has a $1000 personal responsibility cost per incident. The Gold program has a personal responsibility cost of $500 per incident. With CHM there is a cap on how much of your medical bill is able to be shared. All of their programs have a $125,000 sharing limit. This can lead to issues if you or someone in your household were to have a serious medical bill. For example, if you have a medical bill of $200,000, then you would have to pay $75,000 out of pocket. One way that you can get around this is by joining the CHM Brother’s Keeper program. This program protects you against major illnesses or injuries exceeding $125,000. Brother’s Keeper will bring your sharing limit up to $225,000. If you are using the Bronze or Silver program, every year that you renew you will receive $100,000 more on assistance. This renewal increase stops at $1,000,000. If you are a Gold member and you join Brother’s Keeper, then sharing limits are removed. One of the best things about the Medi-Share program is that with Medi-Share you will not have to worry about any cap on that amount that is able to be shared. This is a great safeguard against expensive unexpected medical situations. The only sharing limit that Medi-Share has is a $125,000 maternity sharing limit. Medi-Share partners with telehealth to give their members unlimited, 24/7, 365 days-a-year virtual doctor visits. With telehealth you won’t have to worry about getting up and driving to your local doctor’s office for things such as colds, headaches, flus, joint aches, infections, etc. You can get treated at home in minutes and you will even be able to get prescriptions in under 30 minutes. For more serious situations, you can go to a provider in your area. All that you have to pay is a small $35 fee per visit and show them your membership ID. When it comes to doctor visits CHM is not similar to Medi-Share. CHM does not assist with small doctor visits. With every doctor visit you are going to have to pay out of pocket. With the Gold plan your bill has to exceed $500 before sharing can begin. Interact with other Medi-Share members. Members of the Gold program are able to receive assistance for pre-existing conditions if they meet the criteria. For every new member that you bring in, you will be given one free month of health care. Christian Care Ministry’s has millions of PPO providers that you can go to. PPO means greater benefits and more discounts for you and your family. You can easily search for providers on their provider search page. Some of the doctors that Medi-Share offers their members are family doctors, marriage counselors, dermatologists, optometrists, radiation oncologists, and more. Although CHM does not have as many providers as Medi-Share, CHM has thousands of providers for you to choose from. You can search for a provider by going to their provider list page and adding your zip code, state, and the specialization that you are looking for. For example, allergist, anesthesiology, dental hygiene, home health care, blood work, etc. BBB reveals trustworthiness. BBB takes a look at a number of factors such as complaint volume, competency licensing, failure to address complaint pattern, unresolved complaints, time in business, etc. CHM has been a BBB accredited charity since 2017. Medi-Share has an “A+” BBB rating. Although CHM says that you must be a Christian to join, CHM does not offer a biblical statement of faith, which leaves an open door for anyone to join. Medi-Share on the other hand does offer a biblical statement of faith. Medi-Share holds to all the essentials of the Christian faith such as salvation by grace through faith in Christ alone and the deity of Christ. All members must agree to and profess their Statement of Faith. You can contact CHM Monday – Friday from 9 a.m. to 5 p.m.
You can contact Medi-Share Monday – Friday, 8 am – 10 pm EST and Saturday, 9 am – 6 pm EST. I believe the choice is easy. Medi-Share is the better healthcare choice. Medi-Share actually allows you to interact with other members. Medi-Share offers an actual statement of faith. 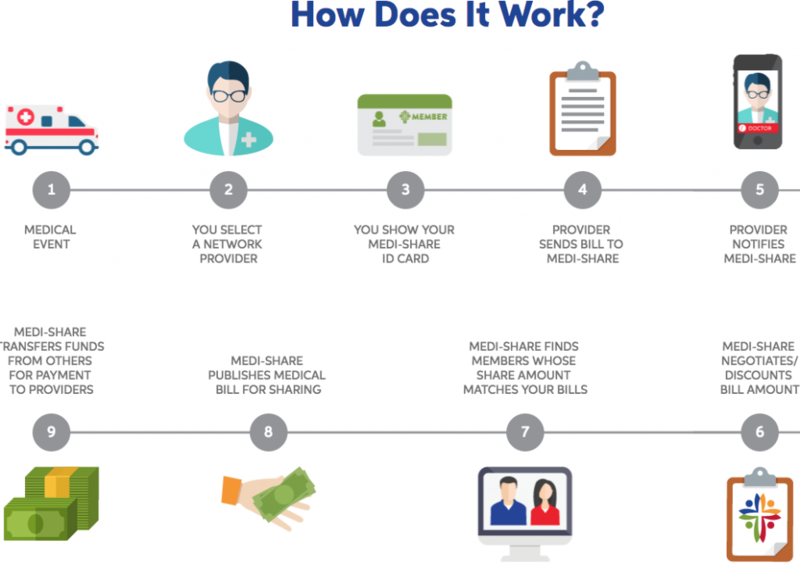 Medi-Share allows you to save more money, you have more providers, it is easier to use, and there are no sharing limits. Check your Medi-Share rates today in seconds.